The Vision Fitness S7100 Elliptical Trainer is On Sale! The Vision Fitness S7100 elliptical trainer offers commercial grade quality for the home. That means you are getting a very low maintenance machine that also gives a rewarding workout. Vision Fitness is the high-end brand of Johnson Fitness, which is the third largest fitness equipment manufacturer in the world. They also manufacture Horizon Fitness and Matrix Fitness. The Vision Fitness brand has a solid reputation and their ellipticals and treadmills are sold online and through fitness equipment specialty stores that cater to the discerning customer. WEEKEND SALE ENDS MONDAY: The Vision S7100 is ON SALE for $2,599 and they are throwing in FREE Shipping. Suspension Design – The S7100 suspension design means there are no wheels, rollers or rails for the pedals to run on in contrast to a front or rear design elliptical trainer. This unique design also reduces wear and tear, and friction and noise. Our team member Fred Waters personally owns an elliptical with rails and he has to constantly lubricate them. Perfect Stride – The Vision Fitness S7100 was specifically engineered to provide a very natural movement through the unique biomechanical and ergonomic design. The motion reduces flat spots and dead spots that can add stress to your joints. There is a consistent ellipse, not a warped elliptical motion that is found on most crosstrainer. 16 Levels of incline from 13% to 39%, in addition to forward and backward pedaling. These alternatives allow you to target different lower body muscles groups. Sprint 8 programming on Vision Fitness ellipticals. Long natural stride that elongates from 20” to 21.5” as you increase the incline. The footpedals are oversized and cushioned, and they pivot in conjunction with the elliptical motion to reduce foot lift and numbness. Footpedals that are only 2” apart for reduce stress to your hip joints. The footpedals are 8.5” off the ground making it easy to mount and dismount. And there is no obstruction to step over. Multi position handgrips for accommodating users of different height, and for targeting different upper body muscles. Compact Design – The assembled dimensions of the Vision Fitness S7100 is 62” x 30”. This is typically shorter than most elliptical trainers in this price range. You get a more compact machine without sacrificing the feel of a commercial grade elliptical for the home. Heavy Unit Weight – The combination of the 240 lbs weight , the unique suspension design and the extra heavy tubing makes this elliptical trainer rock solid. It is warranted for users up to 325 lbs. 23 Lbs. Heavy Flywheel – The heavy weight give the motion a very smooth and natural feel like running in the air. Passport Player Compatible – Exercising in place can be tedious, that is why people often watch TV or listen to music. Vision Fitness has come up with an alternative – running in a virtual environment. With the Passport Player you are able simulate running in the outdoors and it is displayed on your home HDTV. For an additional cost you get a box to connect the S7100 to your TV. It comes with two simulated videos of trails in the foothills of the Rockies and the American Northeast. Your speed on the elliptical dictates the speed of the video. There are additional packages of other famous hiking trails and landscapes. 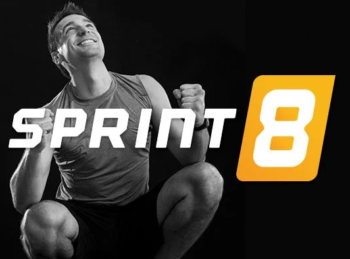 Sprint 8 Training – Sprint 8 is a high intensity training program created by a professional fitness trainer exclusively for Vision Fitness. Through scientific research it was designed to lower your body fat by 20% through 20 minute workouts over an eight week period. The workout consists of a warm-up, alternate intense exercises and recoveries, and a cool-down period. Our team has not actually tried the Sprint 8 so we cannot attest to the claims. However, in talking to one of the Johnson Fitness engineers, he swore by the results and said he was a devotee of the program. 16 Installed Workouts – In addition to the Sprint 8 program there are 16 additional programs like glute burn, calf toner, 4 sculptor, fat burn, custom, etc. You also get several heart rate programs and a wireless chest heart rate strap. Exercising based on your heart rate is a method used by professional athletes to optimize their results. Warranty – The warranty for the Vision Fitness S7100 elliptical trainer is standard for this price range. You get lifetime frame, 5 year parts and 2 year labor coverage. Although with the low maintenance reputation of this machine the S7100 will seldom need service, if any. The Vision Fitness elliptical trainers are in a whole different category in comparison to crosstrainers like Sole, NordicTrack or ProForm. Vision Fitness exercise machines are commercial grade for the home. That means you are getting a truly heavy-duty machine that is extremely low maintenance, and which is designed to take abuse. In addition you are getting a superior biomechanical and ergonomic machine that will minimize stress and strain and will maximize results. The Vision Fitness S7100 is one of the very best choices in its price range. You may also want to check out the Vision Fitness S60 and S70 models. To learn more, check out www.VisionFitness.com. I’m 5 feet tall. I am concerned about the stride length. Will this piece of equipment be comfortable for a person of my height? I have read reviews that say the minimum length offered here will not be comfortable for a shorter stride length. I tend to agree at a minimum of a 20″ stride length, it’s probably going to be uncomfortable for you. You may want to consider a variable stride machine such as NordicTrack FS7i.